The other day when I was going through my pantry I came across some wild rice and I realized that it had been a while since I had done anything with wild rice. Thinking that, I just had to do something with it and I was thinking about a whole grain style salad. Although I had a few ideas, the one that I kept coming back to was a mushroom and wild rice salad that would also indulge my obsession with mushrooms. My normal starting place for mushrooms is to saute some onions, add garlic, then the mushrooms followed by a herb. Leeks had been on my mind recently and I wanted to change things up a bit so I replaced the onion with leeks and I figured that the green that the leeks brought would lighten the dish up a bit. For the herb I went with thyme which goes really well with the earthiness of the mushrooms. I often like to add nuts to a salad like this and I was going to go with walnuts but when I was at the store I noticed some chestnuts which would add a nice sweetness to the dish. The final component was a dressing and a balsamic vinaigrette was at the top of my list. 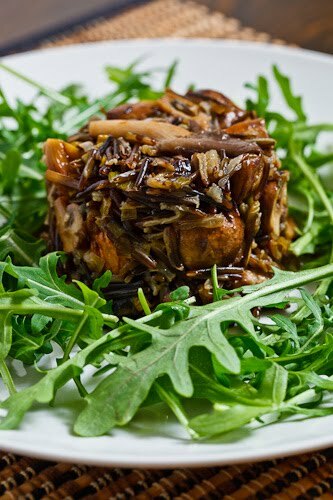 I served the mushroom and leek wild rice salad on a bed of arugula and formed the salad using ramekins. Simmer the wild rice in the broth on medium-low heat, covered, until it is tender and it has absorbed all of the broth, about 40-50 minutes and remove from heat. Heat the oil and melt the butter in a pan. Add the leeks and saute until tender, about 3-5 minutes. Add the mushrooms, thyme, salt and pepper and saute until the mushrooms are just starting to caramelize, about 10-14 minutes. Mix the wild rice, mushrooms, chestnuts and balsamic viniagrette. Take a look at the No Croutons Required grains round up on Lisa’s Kitchen. Brilliant, as usual! I just bought some wild rice too, love mushrooms, and am fairly inexperienced with chestnuts. It sounds and looks delightful! This looks absolutely astounding! Your creativity seems endless and always leaves me amazed. Beautiful. This salad is calling my name! I love the combonation of mushrooms and the addition of chestnuts is really wonderful. I'll have to give this one a try. A very flavorful, healthy salad. Delicious. I love how you describe the thought process behind creating a dish. This looks fantastic and I think it would be a great accompaniment to chicken and other meats. Thank you for sharing! That is such a flavorful salad! This looks very good!Nice blog! I am following u! and let me know what u think!! Oh I love your photo of this dish! Beautiful presentation and simple but effective combination. Lovely Kevin. Yummy! I am currently obsessed with arugula. You really feel like you're eating natural greens when you eat them. I like the presentation! After the holidays seasons bulk eating, this salad is a refreshing change. The wild rice is a great contrast to the lettuce. Wonderful! ahhhh… very interesting to look at… i have everything except the leeks and im still gonna make it ! This looks delish and very flavorful! Mushrooms are one of my very favorite foods to eat! Wow. This looks fantastic. I've just discovered your blog and I love your presentation style! I've never cooked with chestnuts before, but they seem like an amazing addition to this salad. It's nice to see someone using chestnuts outside of the holiday season too. beautiful salad and wonderful flavours – would make a great celebration dinner! Just made this. It was great. I used a rehydrated wild mushroom mix, subbed in black walnuts for chestnuts, and deglazed the leeks/garlic/mushroom with a little white wine. Absolutely divine. Thanks for the recipe! Gorgeous Kevin! I love using thyme with mushrooms as well. I find my magic blend is usually thyme and rosemary. Genius to form the mushroom mixture in ramekins before plating it on the salad!